Enjoy massive discounts on millions of products with the Lazada 6th Birthday Sale, the biggest and most anticipated online sale in Lazada’s history. Over 8 million deals are up for grabs in this three-day long festival, where you can get exciting discounts and promos from major brands such as Samsung, Casio, HP, Nike, Pampers, and many more. Award-winning actress Jaclyn Jose, the only Filipino to win the Best Actress award at the Cannes Film Festival, is this year’s endorser. Lazada’s new instant messaging feature means that you can chat directly with sellers and ask them anything. If you have any questions about a product you want to buy, you can ask the seller beforehand. No more guessing and researching! Adding more fun to the Lazada mobile app is the new built-in QR code scanner. Scanning QR codes give you access to exclusive deals, exciting promos and special pages from top brands and sellers. For one time use only from 12 noon to 2 PM, get 15% off from MasterCard for a minimum spend of P2,000; maximum discount is P500. Use your BDO Visa card on participating gadget brands and get 20% off for a minimum spend of P3,000; maximum discount is P5,000. Promo is valid on April 25. 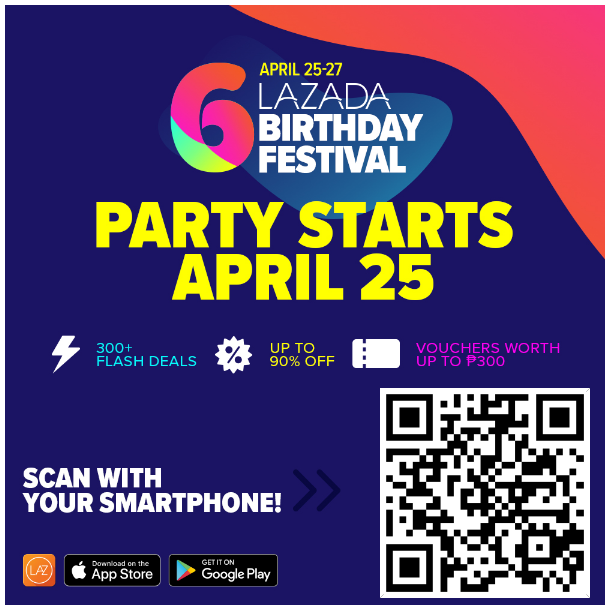 So download the Lazada app now and take advantage of the millions of deals during the Lazada 6th Birthday Sale!